Christmas is in the air and holiday markets are everywhere! 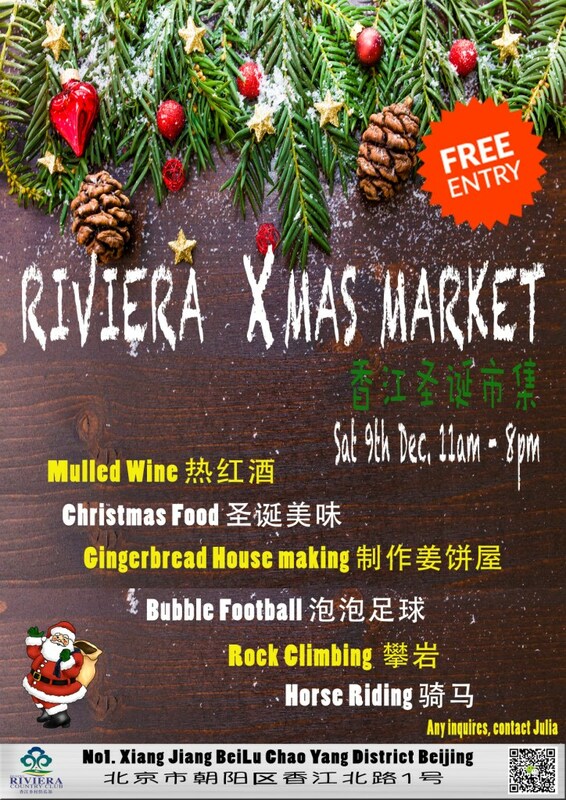 If you’re torn what to do this upcoming weekend, head to Beijing Riviera Country Club and sing along at Carols for a Cause: Riviera Xmas Market, a charity fair and holiday market on Nov 26 hosted by Beijing Riviera and the Migrant Children’s Foundation (MCF). The market will take place at the East Lake Garden in Beijing Riviera from 11am to 8pm, with activities like carol singing for both kids and adults. And to make sure our young merrymakers will have more Christmas fun, there will be booths where they can play bubble football, do rock climbing and horse riding, and even make their very own gingerbread house. If you’re planning to stock up for your Christmas feast, it’s a good market to go as there will be vendors selling essentials like mulled wine, Christmas cookies and chocolates, German stollen (fruit loaf), and punch. All ages. Free to attend. 11am-4pm. For more info, scan QR code in the poster or add Julia on WeChat (ID: chenshihhan) Beijing Riviera Country Club and MCF. No. 1 Xiangjiang Beilu, Chaoyang 北京市朝阳区香江北路一号.